Lignin, the natural polymer that gives tree trunks their strength, could be the source of a new range of skincare products, new research suggests. The lignin polymer contributes to plants' physical rigidity, and also absorbs UV rays, helping to protect the plant's more delicate cellulose structures from sun damage. 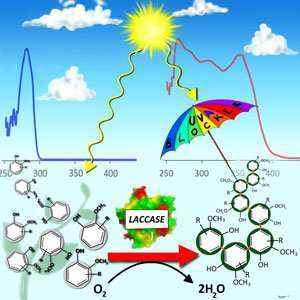 Researchers at A*STAR have found a way to make short-chain lignin-like structures that retain the parent molecule's UV blocking ability, but can be more easily incorporated into sunscreens and other skin products. Although lignin itself is a readily-available renewable resource, the natural polymer's use in performance materials and personal care products is limited by two key factors, explains Balamurugan Ramalingam from the A*STAR Institute of Chemical and Engineering Sciences, who led the current work. High molecular weight natural lignin polymers are inherently insoluble in common solvents, and disperse poorly into mixtures of other materials, making it difficult to work with. The lignin polymer can be broken down into its component small molecule monomers to improve workability, but this removes natural lignin's UV-absorbing characteristics. Ramalingam and his coworkers suspected that the sweet spot for making UV blockers might be to form lignin-like 'oligomers', short-chain structures rather than the long-chain polymers of natural lignin. The team showed they could form lignin-like oligomers either by chemically breaking natural lignin into smaller pieces, or by linking lignin monomers into short chains. Tests confirmed the lignin-like oligomers offered the best of both worlds, combining good solubility and dispersion with useful sunscreen properties. "We were particularly pleased by the broader UV blocking ability and higher molar absorptivity exhibited by the oligomers in comparison with respective monomers," Ramalingam says. The oligomers' UV blocking ability also appeared to be robust and long-lived in accelerated UV weathering tests. The lignin-like oligomers have several potential advantages over existing small molecule UV blockers that are used to stabilize plastics and in sunscreens, Ramalingam says. "In contrast to synthetic small molecule UV stabilizers, the present lignin-like oligomers are bio-derived and presumably non-toxic," he says. As oligomers are physically larger structures than small molecule UV blockers, they are also less likely to leach out of plastics into the environment, or penetrate the skin when used in sunscreens. "We are currently evaluating the possibility of incorporating lignin-like oligomers into commercial sunscreens, towards developing nature-inspired personal care products," Ramalingam says.